Clark and Albert sat at the same old table they'd met at years ago. As per usual, there was hardly anything to drink, and they'd had nothing but sips between them. Near Albert, there were some scraps of bacon, and an egg, scrambled. It was the same order as always. How much does Albert weigh? Clark and Albert sat at the same old table they'd met at years ago. and they'd had nothing but sips between them. Si, P, S, as in Silicon, Phosphorus, and Sulphur, the elements 14,15 and 16. Near Albert, there were some scraps of bacon, and an egg, scrambled. Elements 5 to 8 (one row up) are B,C,N,O. One row down, there's Zn,Ga,Ge, which scrambles to "an egg". It was the same order as always. There were a couple of new cyborgs sitting at the far end of the table though, several superheavy artificial elements were officially accepted recently. Albert is "Al", or Aluminum (13). Aluminum’s atomic mass is given as 26.982. Clark is Chlorine (17), Argon (18) and Potassium (19), or Cl,Ar,K for short. Oh, if only I could upvote a question twice! Albert and Clark are pancakes, so part of the meal. They weigh nothing afterwards because they are eaten. "Nothing but sips between them" is syrup. Albert and Clark are names given to the two pancakes on a breakfast menu item. They've been serving the same dish for years, which is how they met long ago. bacon, a reference to Bacon's cipher; scrambled, a reference to anagramming; and lazy, a reference to I'm not sure what. Possibly the names Albert and Clark are also some kind of clues. I was thinking of Albert Einstein and Clark Maxwell, but it's actually Clerk Maxwell, so no go on that. Presumably our answer will be something along the lines of "fifty kilos" or some such - a weight. Given the letter count of the likely form of the solution, and the fact that five ciphertext inputs of two types are needed for each letter of the plaintext output in Bacon's cipher, I'd guess that words rather than letters or sentences will be the things to be classified into two types. There are exactly fifty words, which is promising as it's a multiple of five. 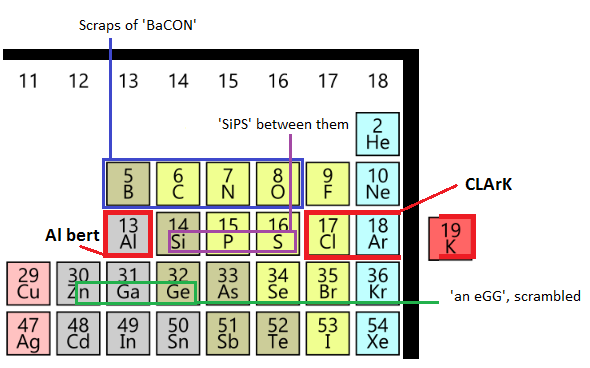 Now how to classify the words into those two types, the "A" and "B" of Bacon's cipher? My first thought was word length: an even or odd number of letters, perhaps. But that would give AABAB ABAAA ABAAB AAAAB BBAAA AAABA BBBAB BBBAA BAABA ABABB, which doesn't translate sensibly via Bacon's cipher. Not the answer you're looking for? Browse other questions tagged enigmatic-puzzle wordplay lateral-thinking knowledge or ask your own question.